Towards the end of 2012 we received news that a new memorial was going to be erected in the village of Mauny to commemorate the 6 Black Watch soldiers who were killed during it's liberation, Major Donald Mirrielees, Sergeant Thomas Kirkcaldy, Lance Corporal Harry Billington, Corporal James O'Keefe, Corporal Harry Chapman and Private George Hildred. The memorial was to be the result of 2 years planning by a local WW2 reenactment society member, Laurent Lecomte who is fascinated with Scotland's 51st Highland Division. A request was made to Dr Tom Renouf to unveil the memorial, Tom was more than happy to attend and set about trying to trace other family members, with the exception of ourselves this proved to be too great a task to complete in time for the unveiling. We were also more than happy to attend and made arrangements to be in Mauny for the unveiling on 1st June 2013. The new memorial was to be sited alongside the existing 1st World War memorial on which could be seen the scars of the battle for Mauny village in 1944. After 12 long weeks of ferocious fighting in the Normandy bridgehead, the 51st Highland Division was to be rested after taking Lisieux, its final objective. 5th Black Watch was ordered to make its last attack on Mauny, stated to be a skirmish by comparison. ‘A’ company would lead the attack on the Chateau which was reported to be the strong point. When ‘A’ company came under fire and held up, ‘B’ company, led by Major Mirrielees, continued the attack from the flank and reached the Chateau. The combined strength of ‘A’ and ‘B’ companies soon forced the enemy to surrender. Intense shelling and mortaring around the Chateau however caused a lot of casualties. During the battle for the Chateau ‘C’ and ‘D’ companies were ordered to attack Mauny village. There was some enemy resistance but this was small by comparison. It is known that Corporal Chapman, Major Mirrielees and George Hildred and possibly Sgt. Kirkcaldy were killed at the Chateau and that Corporal O’Keefe and L/Corporal Billington were probably killed in Mauny village. Reporter David Cowan and cameraman Colin McLean covered the unveiling for STV, their report can be found here. On landing at Beauvais airport my wife and I were greeted by a weather change. The sun shone brightly as we drove off looking for the road to Rouen in a hired Citroen C4. Our choice of route could have been better. Rouen is notorious to negotiate even with a sat nav. Travelling along the open road with the country side fresh and green and the smell of Normandy bringing back memories, I realised that the allure of going back was just as strong as in younger days. After booking in and enjoying a fine Hotel meal we assembled with the friends who had come to Mauny for the ceremony. 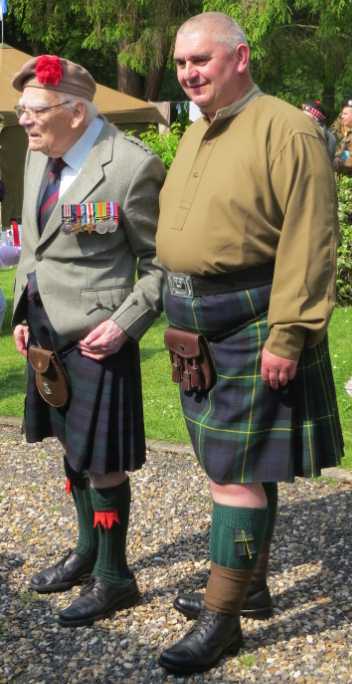 In our company were Ian and Jacqui Scales, niece of George Hildred, Nigel and Margaret McArthur and Tom and Angela Boyd, both families with Black Watch and Highland Division connections. Together with Dave Cowan of STV we agreed a programme to satisfy all interests. On Saturday 1st June a lone piper in shirt sleeve order gave us a warm welcome to the first event on the official programme – a reception and garden lunch at the family home of Laurent Lecomte. The scene on the sun drenched lawn was set by Laurent and his Highland Division re-enactment group, all dressed immaculately in Regimental attire, intent on adding a period background to the proceedings. 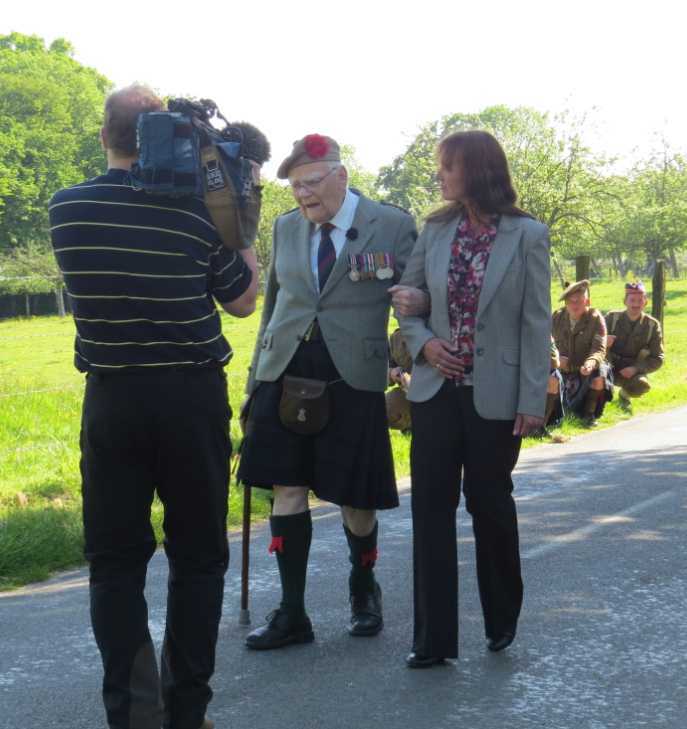 To our delight Valerie Parkinson, friend and guardian of our Highland Division monument at Breville was introduced as our interpreter for the day. Present in the gathering were all those who had helped to organise the day’s proceedings. After lunch a cavalcade of cars headed by four WWII jeeps drove back to the village to be welcomed on the steps of the Marie by the Mairie Charly Noel. The principals were introduced to one another over a glass of wine before moving to their positions. The memorial to our Black Watch comrades was sited beside the impressive War Memorial which stood at the entrance to the village street. A marble plaque carrying the names of our Fallen Comrades was slope mounted on top of a four foot high block of local granite. 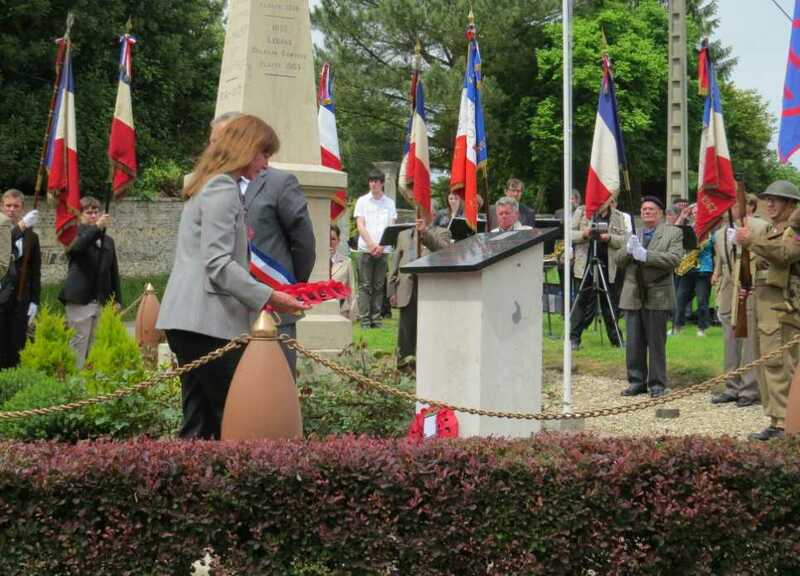 At 1.30pm the ceremonies opened with a grand military parade that impressed the villagers as it marched up the main street to the Mairie and his guests of honour positioned in front of the Monument. It was headed by the Normandy Highland Pipe Band followed by the Highland Division Re-enactment group led by a few stalwarts immaculately dressed in blues mess dress, bearing a Union Jack standard and the others in battle dress with rifles at the slope bearing a Highland Division standard. Bringing up the rear was a dozen Ancien Combattants, each one carrying a standard. As it passed the Mairie the invited dignitaries – the British Military Attaché, the French Army representative and the Regional Commissaire – joined the procession. The procession, some forty strong, took up their positions, forming a semi-circle on the high ground behind the Monument and the dignitaries joined the Mairie’s party. Due to the sloping nature of the ground the assembly was framed in an impressive portraiture that gave everyone a perfect view of what was going on. After a welcome given by the Mairie to his guests Dr. Tom Renouf addressed the large crowd that had gathered. He told the villagers what happened on the day Mauny was liberated and in referring to the battle for the Chateau he described how the intense shelling had caused many casualties and indicated where most of his comrades had been killed. He added that when the Chateau was captured 25 prisoners were taken and most of the villagers were found sheltering in the basement. Among them was a mademoiselle, now a Madam Pavloff, who is here with us today. Jacqui Scales talked about the short life of her uncle George and told of the grief suffered by his many brothers and sisters at his death and how his grave had been visited regularly by her father. A number of wreaths were then laid, including three representing the bereaved families. In his speech, the Military Attaché told that ceremonies of this nature were important because they strengthen the bond between our countries. Then finally the Mairie recalled how the villagers had suffered during the dark day of the Occupation when Liberation was all that they prayed for. The joy that Liberation brought was tinged with sadness when it was known that their Freedom had cost the lives of six Liberators. 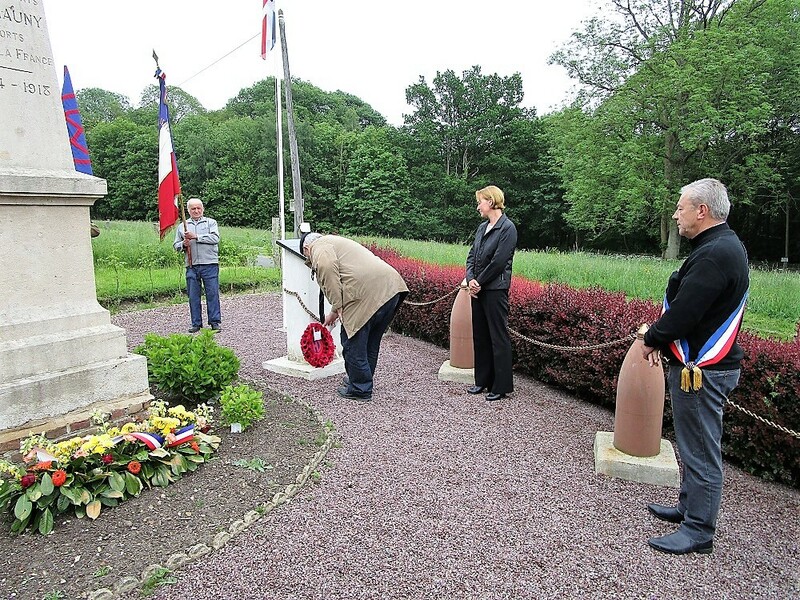 “Sixty nine years later” he stressed “we still remember the debt we owe these young men and today we pay tribute to their memory by erecting a memorial in their honour.” The Mairie then invited Tom Renouf to unveil the memorial. All the speeches were translated into or from French by Valerie Parkinson who by her sensitivity and clarity made the spectators feel part of the ceremony. The Lines to the Fallen and the French equivalent were said by the French liaison officer. This was followed by God Save the Queen played by a twelve piece band from the St. Ouen de Thouberville School. Without hesitation the Flower of Scotland was played by the pipers and then the Marseillaise had everyone singing to the school band. The bugler sounded the Last Post, silence was observed and the Reveille signalled the end of the ceremony, but no, in order to acknowledge the Highland connection with the village the ceremony was concluded with the pipe band playing the Flower of Scotland, beautifully sung by Laurent’s sister. The villagers of Mauny had good reason to be proud of the ceremony. In addition to honouring our Fallen Comrades, the ceremony had been presented beautifully in the best possible Scottish tradition. A vin d’honneur was held in the Marie during which presentations were made and gifts exchanged. As the sole representative of the Liberators, I was made a Citoyen d'Honneur of Mauny and introduced to Madame Pavloff, the only survivor from the basement of the Chateau on Liberation Day. It seemed that the whole 180 population of the village and many more had turned out to support the event. The school band played war time favourites, cameras clicked everywhere, the pipe band gave a recital and the celebrations continued for the rest of the afternoon. With time pressing and Dave Cowan anxious to film the battle site, our group accompanied by the Mairie and a few others, moved to the starting point where ‘A’ company, led by Corporal Chapman’s section, was fired on. In 1944 we approached Chateau Mauny from the south-west first to negotiate a minefield and then a roadblock of felled trees. Another quarter of a mile further on we prepared to climb over a second roadblock when a machine gun opened fire from the woods ten yards ahead. Everyone dived for cover as the bullets sprayed around us. I did not realise I had been wounded until I felt hot blood running down my back. My army buddy Alex Corris, risking his own life, crawled over to me to help me on my way back to the RAP. It was here that Corporal Chapman was fatally wounded. I remembered every detail and recognised the exact spot without the slightest doubt. Dave’s camera man filmed as I described what happened, using our HD re-enactment group to reconstruct the action. With ‘A’ company pinned down unable to advance ‘B’ company was ordered to make a flanking attack on the left. They advanced into the woods surrounding the Chateau where bitter fighting took place as the enemy withdrew into the Chateau prepared to make a last stand. As ‘A’ and ‘B’ companies manned the Chateau boundary wall preparing to storm the Chateau, intense shelling and mortaring rained down on the area causing many injuries. It was at this time that Major Mirrielees and George Hildred were killed. The filming continued as I walked with Jacqui to the gates of the Chateau to tell her the one thing she wanted and yet dreaded to know – the spot where George died. She did not speak and I could only imagine the feelings of sadness and finality tugging at her emotions. During the battle for the Chateau ‘C’ and ‘D’ companies were ordered to attack the village of Mauny. There was some enemy resistance but small by comparison. It is assumed that Corporal O’Keefe and L/Corporal Billington were killed in Mauny village. The day ended with a reunion back in Laurent’s family home where it was agreed by all that the result of the planning and efforts had exceeded all expectations. As we talked in the glow of the setting sun I had to admit that there was one feature that gave me cause for concern and then I told them the story about Ginger. After my wound was dressed and the ambulance was full of casualties, we set off for the hospital in distant Bayeux when I heard groans coming from one of the two stretcher cases I went to see if I could help. To my horror I found the casualty to be Corporal Chapman suffering from a fatal bullet wound to the head. When I looked at the other stretcher case I was shocked to find that it was my friend Ginger, our platoon runner, seriously wounded by bomb blast shrapnel. I was greatly saddened because both of them were survivors of El Alamein, the Desert and the Sicily campaigns. Both had been very kind to me and I felt a sense of guilt that their lives were being sacrificed and I was being spared. When we stopped at the second dressing station the doctor examining my two comrades pronounced that they were about to die. As I stood by the stretchers paying my last respects I heard a song coming from a nearby wireless which brought tears to the saddest moment of my war for it was playing “J’attendrais” which I knew was their favourite song. My concern was that Ginger did not correspond to any of my six Fallen Comrades. He was a Yorkshire man and had an old-timers’ army number. To complicate the matter Sgt. Kirkcaldy was also called Ginger and knowing Army Records to be near perfect I could not explain why Ginger’s name was not listed o n the Rolls of Honour. The problem had troubled me for years. It was Jacqui who suggested that on Sunday when we visited the CWGC at Lisieux where our six Comrades are buried we should look for any other Black Watch soldier killed on 28th/29th August 1944. Next morning our first visit was to the little known memorial at Bourg Achard erected at the crossroads just outside the town by the townsfolk shortly after the war and discovered by George Hildred’s brothers. This modest structure carried a plaque with only the four names of Mirrielees, O’Keefe, Billington and Hildred carved on it. It was erected to commemorate the temporary graves of our Comrades buried in the adjoining field before their bodies were exhumed and re-interred at the CWGC at Lisieux. It was well kept implanted with flowers and possibly visited by the Maire on Remembrance Day. At St Desir cemetery Dave Cowan filmed the six gravestones as we placed small wooden crosses on each one. When we came to the grave of Major Mirrielees, Jacqui pointed out that a root of poppies had been planted there in recent times. It is probable that this was done by some relative which surprised me greatly because my researches indicated that the family line had ended. If not, then efforts should be made to let the family know about the Mauny ceremony and the memorial. Dave then made a hasty exit back to Beauvais for his plane. After most of the others had left I spent some time in the tranquillity of the cemetery searching around the sun drenched graves to find that so many of our Highland Division comrades had been killed during the breakout in the seven day drive to the Seine. As I was thinking of the lives that had been denied my contemporaries, Jacqui gave me a call. When I joined her she had found the grave of a soldier who was killed on 28th August 1944, but to our astonishment there was no name, no army number and no Regiment on the gravestone. It was the grave of an unknown soldier. We did not know what to think. It seemed to be more than a coincidence and we could not resist speculating that this was the grave of my long lost friend, Ginger. Verification was required, then with this I could be certain that it was seven and not six comrades that were killed at Mauny and I would know that one of them was the Ginger I saw die as his favourite song was being played. No longer would he be an unknown soldier, his name could be added to his gravestone, the Rolls of Honour and possibly to his local war memorial. Also the discovery could well be a huge consolation to his family if they were to know about it. We reasoned that the War Graves Commission would not have an unknown soldier on their (named) Rolls of Honour and might not be able to help us. Also we now know from the Roll of Honour of St. Desir that no other Black Watch soldier was killed on the 28th/29th August. We assumed that Army Records would possibly know every Black Watch soldier killed in the War, including those buried in an unknown grave and that this would give us the name we were seeking..
We left St. Desir to go our separate ways. 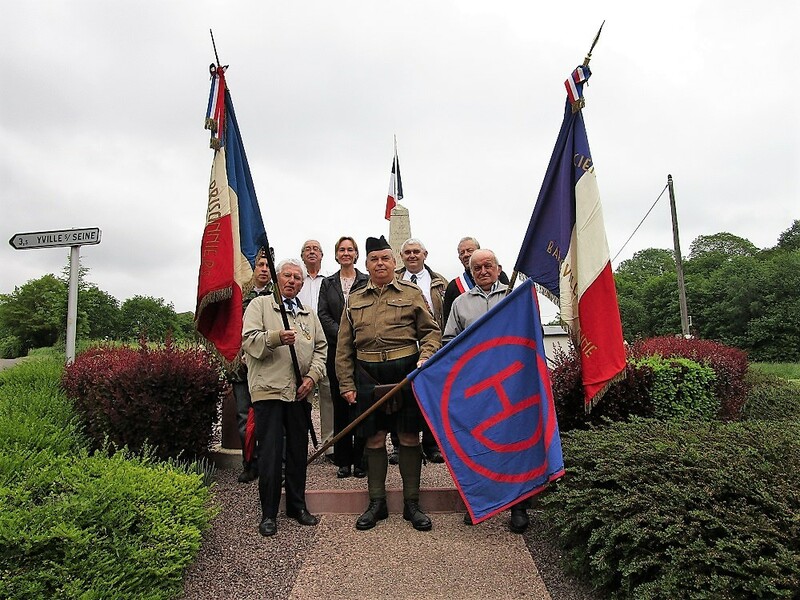 I would spend two days at St. Valery where I found our Highland Division flag bearers Raphael Distante and Maggie Savoye planning for the 75th Anniversary of the 1940 Battle and delighted to know that the surviving POW veterans, God willing, were determined to attend in 2015. On 4th June most of those who attended the Mauny ceremony were reunited to enjoy a wonderful evening of friendship as bar-b-cue guests at the home of Valerie and Kevin Parkinson. Included in the merry company were our HD re-enactment group from Mauny who were camping on Valerie’s estate. On the 5th and 6th we attended several of the ceremonies organised by the Paratroop veterans of 6th Airborne Division. Although the Highland Division fought side by side with the Paras during the ferocious battles of the bridgehead, it was disappointing that no mention was made at these ceremonies of the outstanding part played by the 51st in the battle. It is to be hoped that there will be a strong effort to have HD representation next year at the 70th Anniversary of D-Day. 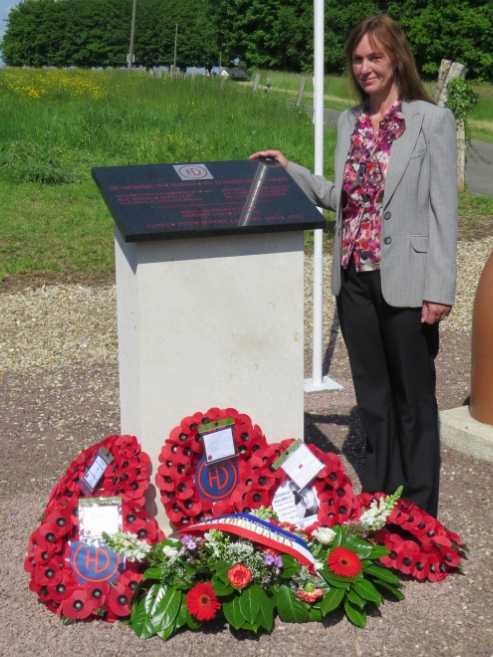 In June 2014 we were once again invited to a ceremony at the Mauny Memorial, we all met up at the Hotel in Bourg Achard on the evening of 31st May, this year we were joined by Rose and her husband Ben, Rose is the Niece of Major Donald Mirrielees and her first visit to the area. The 1st June was an early start to Laurent's parents. Having met others from last year, we were put in cars, headed across the Seine on a car ferry to Chateau Taillis which has a 1944 museum of amazing artifacts - one clever photo developer at the time, took a second copy of a German soldiers personal photo's and kept them, they are unique and not seen by the outside world for many years. Afterwards we headed back to Laurent's parents and lunch, we then set off for the ceremony at Mauny. It was more emotional than last time but no-one could explain why!! Afterwards we joined the Deputy Mayor and villagers for a small reception whilst the pipers played. There was a young band leader looking resplendent in full highland dress, probably aged 7-8 and he took his role very seriously, which was lovely to see. We then departed in cars to the spot where Tom was shot, and he brought out his whisky flask and 4 cups, one for him, one for Rose, one for Laurent and one for Jacqui. We drank to his fallen comrades and then headed off to Chateau Mauny where Laurent's Dad (aged 12 in 1944) said he knew where the hole in the wall was, this is where George went through following Major Mirrielees - sadly falling on the other side. We were allowed inside the gates so we could see the copse from a different angle to last year. The small wooded area is now very overgrown and inaccessible but we tried to imagine the view in 1944 when the trees were small and the brambles were non-existent. Laurent's Father said that he'd covered German mines with material from his shirt so that the British soldiers wouldn't walk on them – as a 12 year old he’d walked with the Germans as the mines were laid, only to go back later and mark them. Mauny. A memorial is erected to the memory of six British soldiers buried in 1944 in the municipality of occupation. 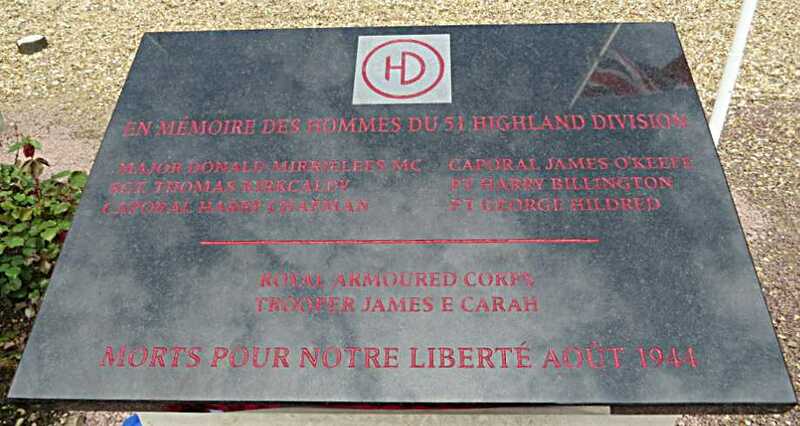 On this Sunday June 1st 2014 in Mauny, 185 inhabitants has honoured its liberators, six soldiers of the Black Watch, 51st Highland Division who died on August 28th 1944 to liberate the village and its Chateau where German troops were holding people hostage in the basements. Among the soldiers of the British infantry sacrificed was young George Hildred, who was killed in the grounds of the Chateau at the age of 18 years. and three families of fallen soldiers. who was fascinated by the story of the liberation of the village. His Father, at the age of 12 years, had welcomed them with a wave. Laurent Lecomte was lucky enough one day to meet Tom Renouf, who then told him the Chateau story. "I was wounded at Mauny and six of my comrades were killed" he says, before detailing the unfolding of this very ferocious battle. "Since that time I was looking for a way to find these names to honour" says Laurent Lecomte. "I had before me one of the soldiers in this battle. Today my mission is filled. On the monument are engraved forever the names of these heroes who came from Scotland and died to liberate us. May they never be forgotten". In June 2015 we revisited the memorial, this time with Christine (George's youngest Sister) and Mavis (George's Sister in Law). We were joined by Laurent, his parents and Nigel & Mags, we had a short service followed by a minutes silence. Afterwards we stopped off at the Chateau to show Christine the area where George had fallen, Christine commented that she hoped George had not suffered and died instantly. A small remembrance service was kindly arranged by Laurent and overseen by the Mayor of Mauny.